GAMER'S INTUITION - Game reviews - Burn, Zombie, Burn! 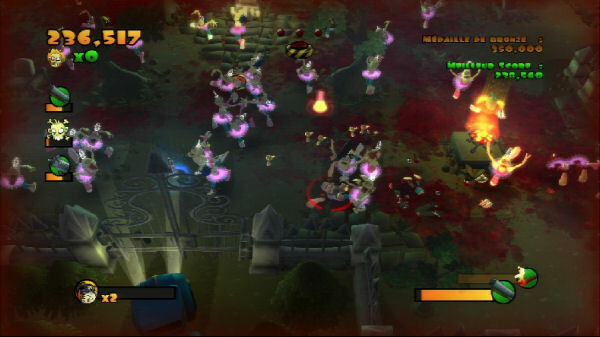 Zombies seem to be a running theme this Spring as titles containing them are beginning to flood the marketplace. House of the Dead: Overkill and Resident Evil 5 are of course the two big names, but for those who don't wish to shell out so much cash, Burn, Zombie, Burn!, a PSN alternative, is now available for your perusal. Played from a zoomed out, angled perspective, Burn, Zombie, Burn! is your classic arcade shoot-em-up, which places you in the role of Bruce (an unquestionable nod to Bruce Campbell) a stereotypical everyman who finds himself trapped in a town being overrun by zombies, and must survive against the rapidly multiplying hoard for as long as he can. 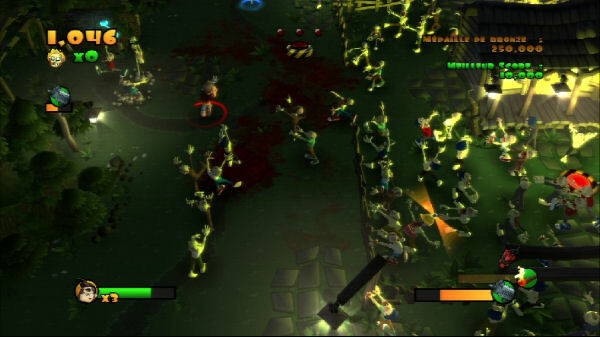 Each of the game's levels (whether in timed or free play modes) sees you surrounded by dozens of zombies ranging from your classic wobbling moaners to a humorous variety of dancing zombies, which twirl around the environment whilst wearing frilly pink tutus. There are zombies that use metal trash can lids for shields, an exploding variety that will eliminate others surrounding them once destroyed and even zombies with thick helmets that charge at you like a rabid animal. All of this variety is a bit lost once the game really gets going however, since there is so much action going on onscreen at once that you'll likely find yourself simply holding down the L1 button (auto-aim) and bashing on X as fast as your thumb will allow. 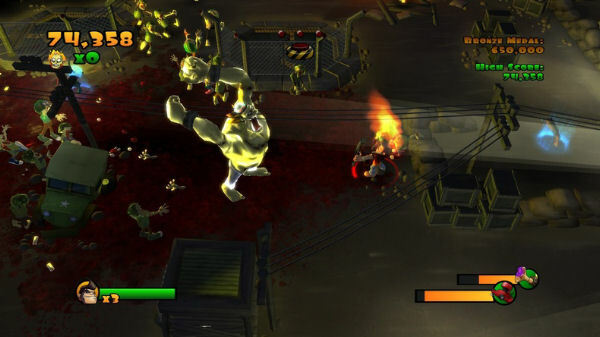 Bruce comes equipped with a standard issue pistol containing unlimited ammo, and a torch which can be used to scare away zombies or set them on fire, as the game's name would suggest. Other weapons must be procured on site, with options becoming available as you defeat wave after wave of zombies. Some weapons, like your standard pistol can be fired with only one press of the X button, with holding down said button allowing you to continually fire your weapon until you run out of ammo, but most of the time, you'll get far more shots off by rapidly pressing the X button on your own. That being said, after spending five or so minutes with the game, your right thumb will undoubtedly begin to feel the effects of all of this button mashing, making the game more easily playable only in short sessions, which is unfortunate, as the game requires a certain amount of dedication in order to beat the high scores in each level, which just so happens to be the only way to unlock subsequent stages. Helping the game from becoming stale and repetitive is the weapon variety in each level. While you can easily progress using nothing more than the tools you start the round with, options like Uzis, Gatling Guns, baseball bats, shotguns, and so on add a lot more strategy to the formula, which could easily become a repetitive mess without the added variety. An in-depth TNT upgrade system is also available that allows you to create a variety of TNT explosions that with explode either on a timer, on contact, or at a time of your choosing, allowing you to lure a group of zombies into the area surrounding the TNT only to quickly vacate the premises and destroy it and all of the surrounding zombies from afar. 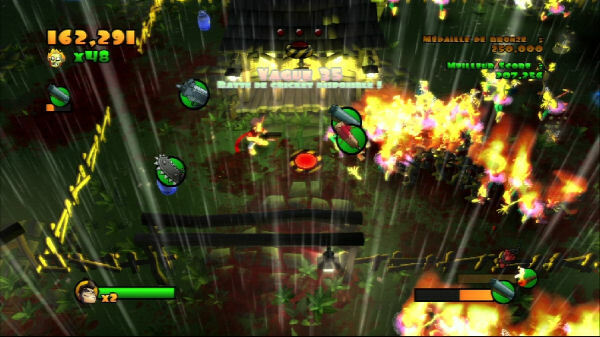 As the main goal of each level is to survive long enough to beat the game's required score for unlocking the next level (the first level's goal is a whopping 250,000 points, with each level thereafter requiring more points), your best bet will be to utilize either your always at-the-ready torch or the randomly spawning flamethrower to set the undead scourge on fire. Doing so increases your multiplication counter, allowing you to really rack up the points. For every zombie that is on fire, there is also a chance that they will set nearby zombies aflame, allowing you to earn even more points with no extra effort. One thing to note is the fact that as zombies burn, they become stronger and faster creatures, creating a real double-edged sword situation. 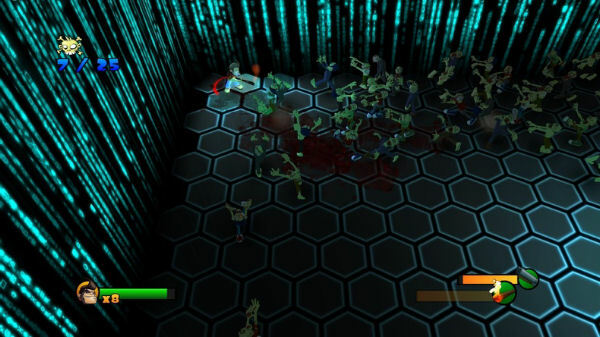 Slow and steady may win the race, if you choose to ignore the possibility of burning zombies altogether, but with each level requiring a staggering amount of points to complete from the beginning, you can expect progress to come slowly, or not at all, if you choose said route. Rounding out the gameplay is the ability to rack up extra points for using the same weapon over an extended period of time. Each level contains a stereotypical "big red button," which many will recall from multiple films should never be touched. However, once you use a weapon long enough, you are in fact encouraged to hit the big red button, with each level's button offering a different effect. That is, one button may cause rain to pour down, extinguishing any and all flames surrounding you while another releases a beam of light that disintegrates anything in its path, save for Bruce himself. This big red button is normally located in the center area of each level, which, while conveniently located in theory, actually makes pressing it more than just a bit of a risk, as zombies that spawn in the four corners of the map will cross said center area to get to you (a path of least resistance situation, if you will). That being said, each level may have a different graphical theme: a country homestead, a spooky graveyard, an abandoned neighborhood, and so on, but each is constructed in a similar fashion, with a large open ring or track running along the outside border of the level and a large open area in the middle. Separating the two areas are fences, small buildings, campfires, tombstones and other expected faire. Overall, the graphics are cartoony and nicely done, although lacking detail since the game is played from such a far away perspective. 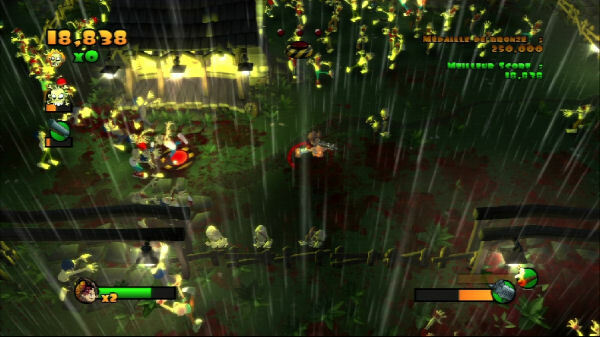 All of the little green zombies appear more laughable than menacing, but by destroying one and sending a mist of blood and body parts all over the environment, there is still a true sense of satisfaction that arises, especially when using a weapon like a shotgun, which allows for multiple zombies to be eliminated at once. Likewise, the sound department is what you would expect from such a title. A flurry of moans and bullet fire fills the environment as you make your way through each level, all accompanied by an eclectic mix of rock guitar solos and the expected gloomy tunes one might play in a haunted house. All in all, Burn, Zombie, Burn! is a humorous, surprisingly challenging, incredibly repetitive yet satisfying offering, which, after mixing in extras like trophies becomes all the more addictive. 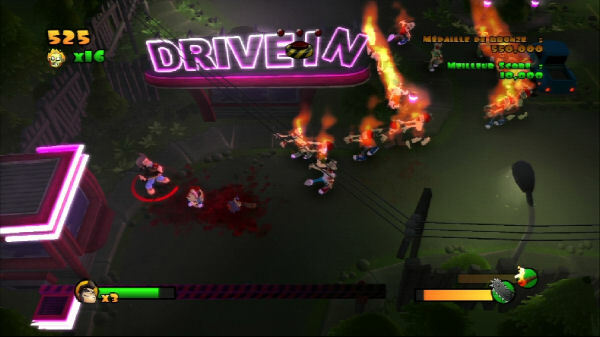 If you've got an extra ten bucks just waiting to be spent in the PSN store, Burn, Zombie, Burn! is a solid choice. Special thanks to Kuju and doublesix for providing a copy of this title.